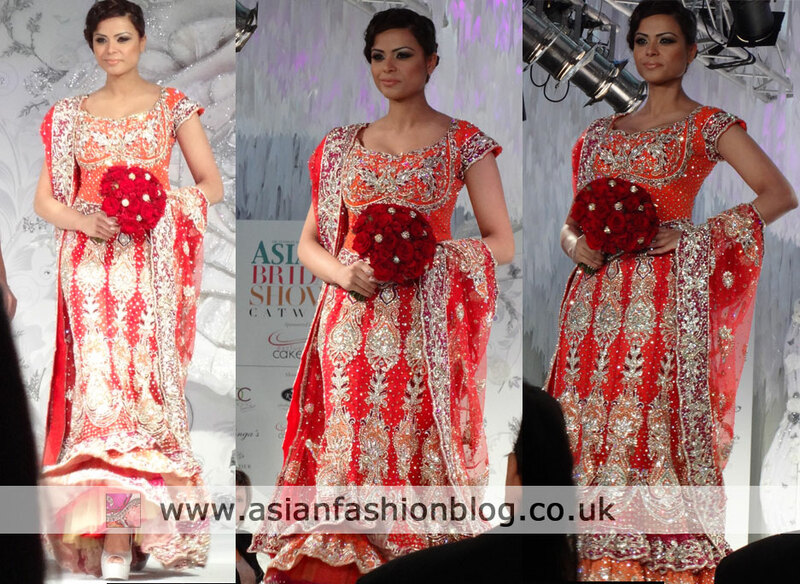 One of my favourite wedding events of the year, the 2012 Asiana Bridal Show, returned to London this weekend at the Park Plaza Riverbank. The exhibition opened at 10am to a small crowed eager to check out all the wedding suppliers. I was one of the early birds and even though the exhibition was open til much later on in the evening, it was still starting to feel very busy in the first few hours. I'll be writing a bit more about my fashion-finds at the exhibition stands in more detail in future blog posts, but now onto the main attraction - the fashion show! 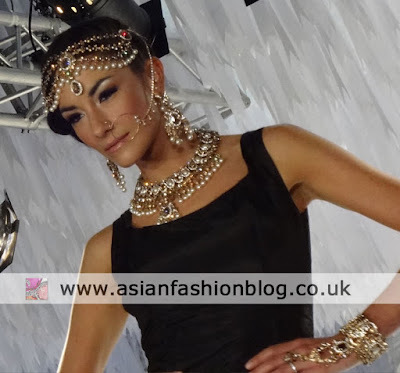 First let's rewind a little bit: the beautiful clothes on show at the 2011 Asiana Bridal Fashion Show were overshadowed by the fact that there was a distinct lack of brown faces on the catwalk. Thankfully, this wasn't an issue at the 2012 show - I felt there was the right balance and regardless of ethnicity I think all the models carried the outfits well and did a great job. Seating as always was a bit of an issue, I didn't have a VIP reserved seat this year, but Ziggi Studio very kindly let me have one of their exhibitor passes so I managed to get myself on the 4th row. The only way to get a seat on the front three rows was to be on the guest list of one of the big sponsors - Madhu's, Sony Entertainment, or Sunrise Radio. I'm not going to be too critical of this policy, as those sponsors have obviously paid to put the whole show together, but I will say that a lot of their guests didn't look like they were shopping for wedding outfits! RDC opened and closed the show, here are two of my favourite outfits from their catwalk collection. Having visited their store (on Ilford Lane - East London) in the past I've found their outfits to be quite reasonably priced and being a bit of an online-addict I like that they keep the RDC facebook page regularly updated with their latest designs. 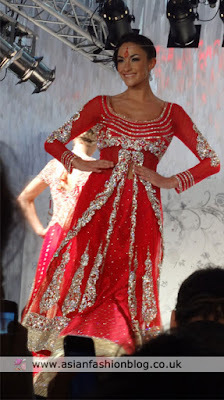 Kyles Collection were second up on the catwalk. My camera struggled to get photos of all the pieces close up but I managed to get a clear-ish photo of this set. 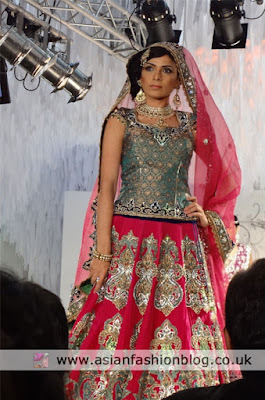 I wore a shingar patti from Kyles Collection on my wedding and if I got the chance to dress up as a bride again I would definitely wear another of their head-pieces like this one. 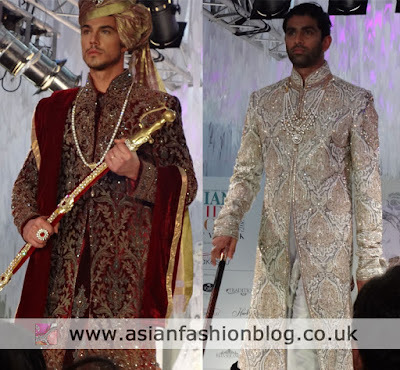 Traditions showcased a collection of bright white registry-style gowns, followed by a few red, more indian-style bridals - all with matching menswear. I liked the addition of orange in the outfit below. 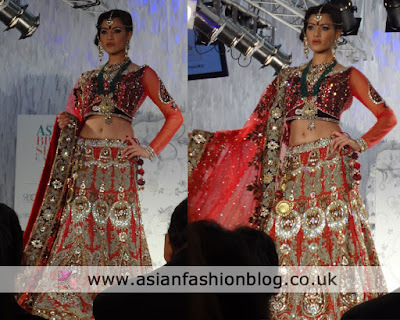 Cakes4U presented some of their cakes on the catwalk, alongside outfits by Arinder Bhullar. I like cake, and I like dresses, but sometimes I think you can get a bit too matchy matchy! 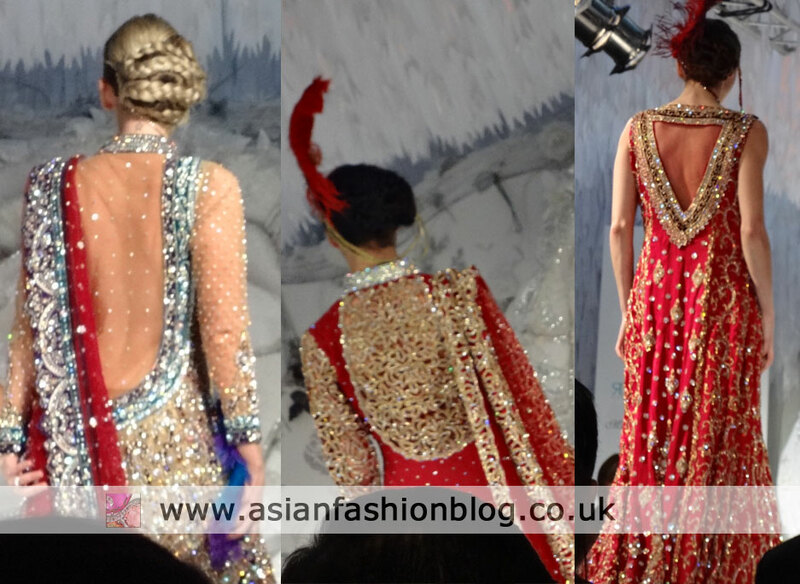 Frontier Raas had some really bold single coloured outfits. I really liked this yellow outfit. I don't think my photos do it justice, but in person it stood out on the catwalk and looked very vibrant. As far as I remember, this was the only yellow outfit on the catwalk. Make-up artist for the show, Jawaad had a small segment in the show to demonstrate the hair and make-up efforts of his team. 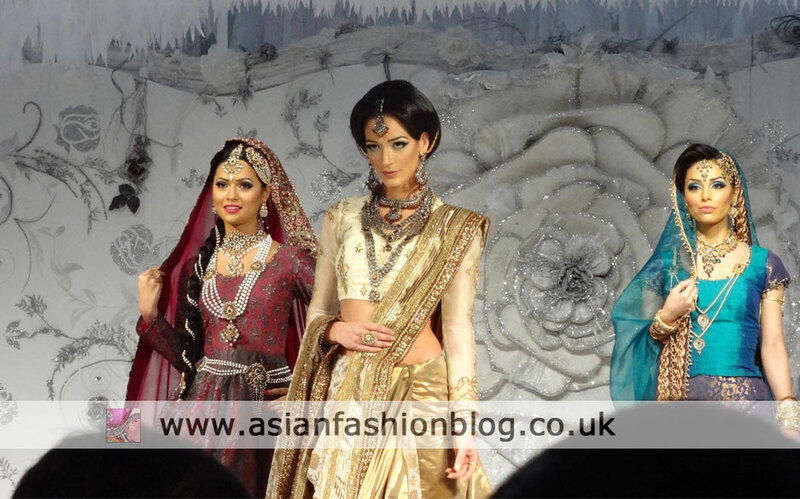 The outfits were provided by Mona Vora. Ziggi Studio were up next with their menswear collection. I think this was one of the most popular segments of the fashion show as there was lots of eye candy for the largely female audience! Ekta Solanki's collection was one of the most popular from the 2011 Asiana Bridal Show and this year's collection didn't disappoint. I must admit I do have a bit of a weakness for hot pink lenghas and green is also another of my favourite colours so you can probably see why I liked this outfit! 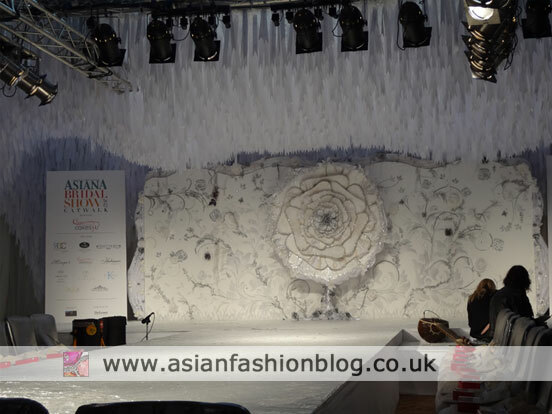 The fashion show was put together by Naseeba and the Ooops team and the beautiful backdrop was created by Maz of Leicester. 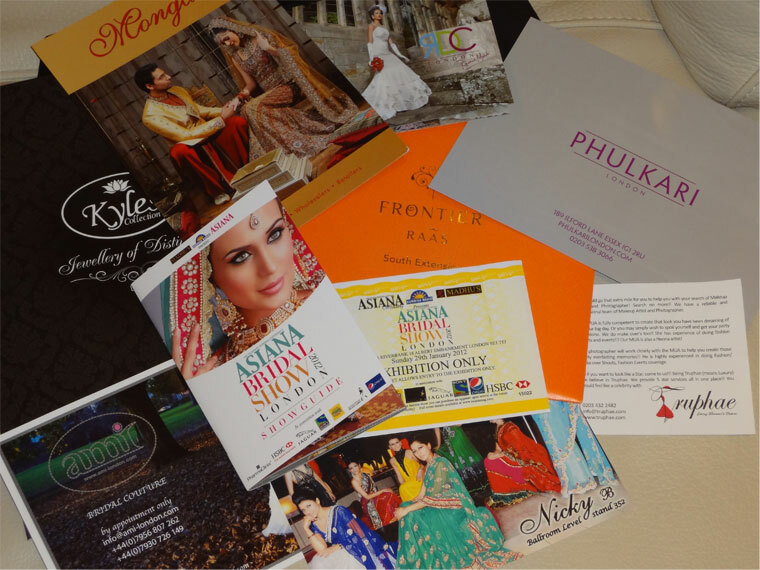 Did you attend the show? What did you think? Do you think the Asian Wedding Exhibition in Manchester end of Feb will be worth attending ? Always seems to be the poor cousin of London and even Birmingham shows. The Show team at Ooops. hi..the show was great but i noticed the rdc london collection was the same as a designer called shazia kiyani who had these designes on the london extravaganza in 2011.
anonymous - I noticed that too when I did a more detailed blog post on the RDC collections (www.asianfashionblog.co.uk/2012/02/rdc-open-asiana-bridal-show-london-2012.html). I think they're working as a stockist for Shazia's Bridal. They opened and closed the show and their final collection was more what you'd usually expect to see from RDC.